Greece The Age of Heroes Activity - HISTORY'S HISTORIESYou are history. We are the future. The storytelling tradition that developed during the Greek Dark Ages allowed much of Greek history and heritage to be passed down from one generation to another. Tales of the Mycenaean period were kept alive through songs and stories that were repeated during religious festivals or feasts. Another outcome of storytelling during this time was a resurgence in Greek art. The stories told during the Dark Ages became the basis for Greek drama, sculpture, and a new style of pottery. The Greek pottery that developed was an extension of the storytelling tradition begun during the Dark Ages. Before their conquest by the Dorians, Mycenaean pottery styles mostly mirrored those practiced by the Minoans. In fact, during the late Mycenaean period, artists had just begun to decorate their pottery with paintings that included human figures, rather than nature scenes. After the Dark Ages, artists once again included humans on their pottery, but this time the scenes were almost exclusively based on the heroic tales of the Mycenaean age or on Greek Mythology. For this first activity, you will read a short adaptation of just a small part of Homer's Odyssey. The Odyssey is Homer's tale of Odysseus' long journey home after the Trojan War. Then, you will choose a style of Greek pottery from those below and print it's template. Your job is to re-tell the story of Odysseus by decorating a Greek vessel. Use the words of Homer to inspire your art work. If you are familiar with Greek mythology, however, and would like to decorate a vase or jar with a scene from another myth, you are welcome to do so. AMPHORA Today we give cash bonuses to athletes. We film them endorsing their favorite products. But in early Greece, victors in the Pan-Athenic games were awarded oil, and the oil was stored in large ceramic vessels called amphoras. KRATER It was considered uncivilized to drink wine straight... so mixing it with water was a social ritual. The early Greeks used a krater for this process. It's a large bowl with a wide mouth. HYDRIA If your chore was to bring home the water, you'd carry it in a hydria. A hydria has three handles. The two on the shoulder of the vessel are for lifting. The handle at the top makes pouring easier. Homer’s Odyssey is a collection of stories about the adventures King Odysseus and his men had while sailing home after the battle of Troy. Odysseus and his men lived on the island of Ithaca. Ithaca is a little island as far away from Troy as you can get and still be in ancient Greece, so it was a long trip. It could have taken Odysseus a good month to get home. These were early times, and the ships were not as strongly built as they are today. But because of all the perils they faced on their way home, it took Odysseus and his men ten long years to get home. In ten long years, Odysseus and his men had quite a few adventures, and all of them had to do with mythical creatures! The Cyclops Cave: After Odysseus and his men had been at sea for a while, their supplies began to dwindle. Odysseus and some of his men landed on shore to look for food. They found a cave, full of sheep! They cooked some sheep and stuffed themselves full. 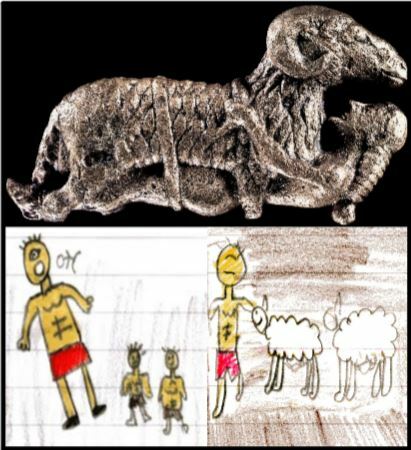 Unfortunately, the sheep belonged to a Cyclops. A Cyclops is a one-eyed giant! CLICK to watch Francis Ford Coppola's adaptation of Homer's Odyssey. When the Cyclops returned to his cave, he was furious. He locked Odysseus and his men up so they could not get away. Using trickery, Odysseus managed to get the Cyclops drunk. Odysseus sharpened a stick and blinded the Cyclops. The Cyclops tried to find Odysseus and his men to eat them. But Odysseus and his men crawled under the sheep. Making bah-bah sounds, they crawled safely out of the cave and got away! The Sirens: Not too long after that, Odysseus and his men ran into the Sirens. The Sirens were magical sea creatures that looked rather like mermaids. They were known for their beautiful singing voices. The music they made was so hypnotic that sailors stopped sailing their ships to listen. With no one in charge, the ships crashed into land, killing everyone on board. When Odysseus heard the beautiful music, he was immediately suspicious. He had already had quite a few adventures. He was beginning to be a bit suspicious of everything! To be extra safe, he stuffed his crewmen’s ears so they could not hear the music. He tied himself to the ship’s mast. That way, although he could hear the music, he would not be able to jump off the ship or swim to shore, or to do anything else that might endanger himself or his crew. It worked! Odysseus is still the only man in the world who ever heard the Sirens sing and lived to tell about it! After many more adventures, the goddess Athena took pity on Odysseus, and helped him find his way home. So that the adventures of Odysseus would never be forgotten, the great Greek poet, Homer, wrote these stories down over 2500 years ago. Above, a 5th century CE copy of Homer's Iliad. In the absence of writing, story telling during the Dark Ages not only preserved the Greek historical record, it served as a primary news source and as entertainment. Story tellers roamed the Greek countryside, stopping at villages and towns along the way to share news and to retell the stories of the heroes who lived during the time when Mycenaeans ruled the Aegean. The role these storytellers played was not unlike that of a contemporary musical star on tour. The storytellers were entertainers. Villagers and townspeople anticipated their arrival and flocked to the performances of well-known "stars." The stories they told were epic poems and, due to traditional rhyming schemes, the stories had a well-defined, metered beat. When listened to, the stories sounded just like song. Among the best known of the storytelling stars was the blind bard, Homer. Homer lived right at the end of the dark ages, in the 8th century BCE. For the Greeks, Homer was the ultimate symbol of poetry and eloquence. He was a wandering storyteller with an unmatched ability to dramatize a narrative. Over 2700 years ago, Homer wrote two long, poetic tales that celebrated the battle deeds and travels of heroes and the influence of gods. Homer's Iliad recounts the story of the Mycenaeans during the Trojan War. While many historians are still unsure whether the war actually occurred, excavations in present-day Turkey have uncovered the remains of a city believed to be Troy. Furthermore, investigations have indicated that a siege may have occurred during the Mycenaean period. As a result, many now believe that Homer's tale is based on fact. Homer's Iliad is 15,700 lines long. For this activity, you will read a much abbreviated version of Homer's famous tale. Your job will be to transform the story into a more contemporary song form, rap. After reading the story, you'll work as part of a small team whose job it will be to create one verse of a rap. You will perform your rap for the rest of the class and together we will create a music video of your song. Instructions: Each group will write their own verse. Each verse should be 6-8 lines long. Each group will rap their own verse with the rest of class providing the chorus. Group Five/Fifth Verse: Achilles leaves his tent to avenge his friend’s death, and kills Hector. Chant this Greek chorus after each verse: Honor and virtue lead to fame/ Achilles the Hero, we call your name! The Trojan War had been going on for ten years when the events from The Iliad take place. Agamemnon, the greatest king of the Greeks, and Achilles, the greatest warrior of the Greeks, had an argument, a big argument. Achilles stormed off and returned to his tent in the army camp. He vowed never to fight for Agamemnon again. While Achilles was sitting in his tent, the Trojans found out about the argument. The Trojans knew that their own great hero, Hector, could win the battle if the Greeks were without Achilles. The Trojans attacked. One by one, the other Greek heroes were wounded and put out of action. Hector could not be stopped. The Trojans made it all the way to the beach and started burning the Greek ships. Without their ships the Greeks would have no way to escape or to get supplies. The Greeks begged and pleaded with Achilles to come out of his tent and save them. Achilles was concerned for his comrades, but he remained resolute. He would not fight for Agamemnon again. He was not coming out of his tent. Patroclus, Achilles’ best friend, and a pretty big hero himself, asked if he could wear Achilles’ armor into battle. The idea was that this might trick the Trojans into thinking Achilles was back in the fight. That would scare them so much that the Trojans would run away. This solution allowed Achilles to keep his vow yet still help his comrades. When his best friend, Patroclus, begged for the privilege of wearing Achilles’ armor into battle to trick the Trojans, Achilles said okay. Patroclus put on Achilles armor and entered the fight. The Trojans, seeing what they thought was Achilles coming after them, started to run away. But Hector stood firm. He wanted to fight Achilles. Hector attacked. The man he fought was not Achilles. It was Patroclus, dressed in Achilles’ armor. Patroclus fought bravely, but Hector won. When the Trojan army saw what they believed to be Achilles, lying dead, they turned back and attacked the Greeks with great spirit. In his tent, Achilles heard what happened. He heard that his best friend was dead, and that Hector had killed him. Achilles got angry. He put on his extra armor and stormed out to fight. He hit the Trojans like a tidal wave, scattering them and making them run for the safety of the walls of Troy. He wasn’t interested in the Trojan army. He wanted Hector. He chased after Hector. The two men fought. Achilles won and Hector was killed. Without Hector, the Trojans retreated to Troy. This is where The Iliad ends.